These premium hooks are ideal for strollers, shopping carts, wheelchairs or anywhere you need an extra hand. 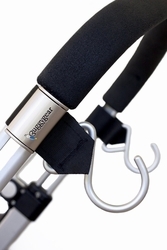 Our two of a kind pair are the safest stroller hooks available. They attach at a lower center of gravity which can prevent tipping on even the lightest of strollers. These heavy duty Buggy hooks are the first and only hooks which are made without Velcro or plastic. Instead they have a unique belt system with a heavy duty metal hook that attaches with ease and perfectly matches your stroller. Designed in the USA using high quality, durable products that will last longer than your stroller pushing days. They're safe, strong, secure, forever. Stroller hooks come with a lifetime no hassle free replacement guarantee.